Women in Motorsport New Zealand was formed in 2012 as the local interface to the FIA Women in Motorsport Commission and our primary goal is to support women who compete, volunteer, work in and are passionate about motorsport in New Zealand. Women in Motorsport New Zealand is now one of seven Advisory Commissions of MotorSport New Zealand, and in 2018, six members were appointed to the commission. Through our initiatives, we aim to increase the participation of women across all facets of motor sport in New Zealand. Driver training and women in motorsport track days. Women in Motorsport Exchange programmes for female volunteer officials. Mentoring women as they get involved in motorsport as competitors or volunteers. Developing a database of women in New Zealand motorsport through which we’ll share and promote our achievements. Sharing and promoting New Zealand’s women in motorsport via key channels such as the dedicated WIMNZ website, Facebook page, Twitter and Instagram accounts, and MotorSport New Zealand’s official publication, Accelerate. 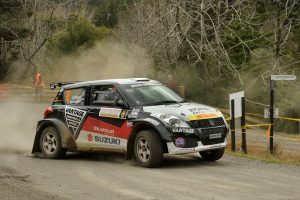 Emma Gilmour rallying in her Suzuki Swift Maxi.